Jerome, as a youth, was brought to the Grantsville area from Georgetown, Md., by a man who had a number of slaves. Brown described him as "... an exceedingly bright, likely, and intelligent boy. Jerome was then about 17 years of age, fair skinned, and as intelligent as any white man in the neighborhood. Just as he was maturing for the cotton fields of Georgia, he ran away, and so effectually, that no one for 50 years knew anything about him. However, a few years before the Civil War, a gentleman of elegant appearance and address, halted at the Stone House Hotel, and inquired for the only surviving son of the deceased owner of the group of slaves. It so happened that the person sought for was then on the premises. The stranger appeared to experience great pleasure and interest on this new acquaintance, and proposed to visit him at his home, a few miles away. The visit was made to the plain old farmers home by the gentlemanly stranger and much enjoyed for several days. At last the guest proposed to his host to take a walk over the farm. Some apprehensions were aroused among the family, and some of them shadowed the strollers in their walk. After a while a small field with eradicated trees and stumps, on an angle of the farm was reached. ‘I am Jerome,' was the rejoinder; a shock and long silence was the result. Jerome told his friend that his visit was about concluded and his long wishes were gratified. He invited his former quasi master to accompany him to his hotel and spend the remainder of the day together. He simply said, at his home in the distance, he was as free, white, prosperous and respected as any man in the community, but his residence should be as unknown as the source of the winds themselves. This singular man has never been heard of since his mysterious visit to his old bedimmed walks. The story sounds like fiction, but it is as real as slavery was itself. Text: The above article was written by and provided courtesy of John A. Grant for a Garrett County History course offered at Garrett College during 2001 and 2002. Photograph: This is the "Old Stone House," also known as Tomlinson's Inn at Little Meadows. It is most likely the structure referred to in the above 1889 account as the "Stone House Hotel". 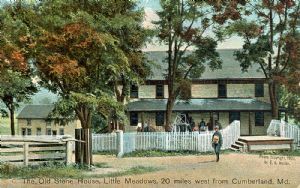 Located three miles east of Grantsville, the Inn was constructed along the National Road about 1818. Built by Jesse Tomlinson, a well-known postmaster and state legislator, the Inn was a local meeting spot and served the National Road between 1820 and 1850 when stagecoach and freight traffic was at its heaviest. The postcard depiction is from a 1908 photograph taken by E. K. Weller and is from the collection of Albert and Angela Feldstein.